NASA’s twin Mars rovers, Spirit and Opportunity, remain one of the Agency’s greatest achievements in exploration. On Earth, these robots are best known for their stunning pictures of the Martian landscape —images that, in addition to providing invaluable scientific data, have also given ordinary people an unprecedented look at the Red Planet. While the rovers each took a mere 1 megapixel camera for the journey, the pictures they have become famous for measure up to 96 megapixels in size. This was made possible by a NASA-built automated tripod, which with the help of photo processing software seamlessly integrates a series of smaller shots into one large image. Today, using the same technology, baseball fans are enjoying their own version of highly detailed panoramic pictures—and are sharing the benefits through social media. Through multiple commercial partnerships, NASA and Carnegie Mellon University first brought the supersized digital picture technology to the market as the GigaPan robotic platform (Spinoff 2008). Soon after it had spun off into consumer applications, the technology’s potential caught the eye of Major League Baseball Advanced Media (MLBAM) LP, based in New York City. The opportunity came when MLBAM was approached by David Bergman, a professional photographer experienced with the GigaPan system. Bergman received a high degree of recognition for a GigaPan photo he took during President Obama’s inauguration in 2009. “I always try to make unique images using technology,” he says. “When I got the assignment, I knew I had to produce something that could live up to the magnitude of the event.” The resulting photo—a 1,474 megapixel shot that details thousands of crowd members, including every living former president—received over 15 million views online and was profiled by every major news outlet. Following consultation with Bergman, MLBAM worked with GigaPan engineers to customize the system for capturing large scale in-game shots, photos that the MLB hoped would become a new platform for engaging and energizing its fan base. The resulting technology is now licensed to MLBAM, who offers its benefits to individual teams and supports its use in stadiums nationwide—with Bergman taking many of the photos. “We were looking for a way to make the photos personal and interactive. Photos taken during games are displayed as navigable images on MLB.com’s TagOramic website. While nearly the entire stadium can be viewed at a glance, thanks to the image’s high resolution users can zoom in to see individuals in the crowd with remarkable detail. 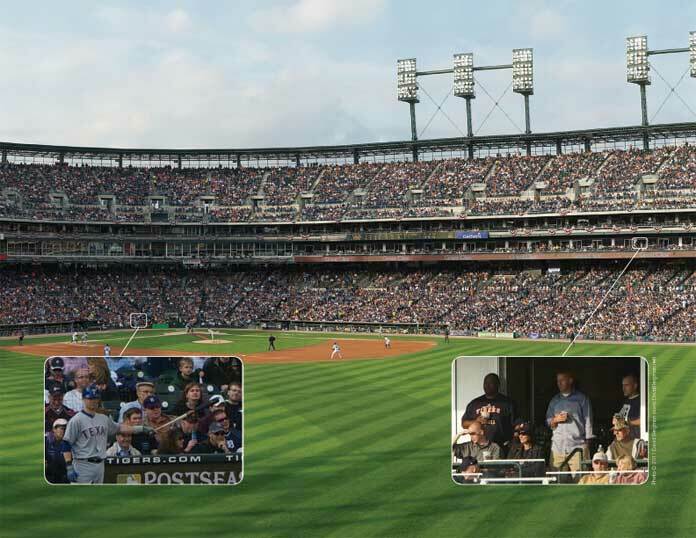 This Gigapan image was taken at a Detroit Tigers game during the American League Championship Series in October 2011. The 1,777-megapixel photo is comprised of 300 individual shots taken over 18 minutes that were subsequently stitched together. Users who view the image online can zoom in to high levels of detail, shown here to the right and left. Nicole Blaszczyk, marketing coordinator for the Detroit Tigers, says the technology came at a good time for her organization. “We have had a photo booth in the park; however, because it’s been there for so long, it wasn’t piquing fan interest as much.” Rather than enticing fans into an individual shot, the Gigapan camera captures nearly everyone in its series of candid photos, typically spanning a period of time under 20 minutes. Once the images are stitched together, users can explore almost the entire stadium, zooming in to high levels of detail. Just as fans use the images to publicly associate with their team, teams are using the opportunity to better serve their fans. The Detroit Tigers, for instance, place the pictures on their website and social media pages to generate additional web traffic. Users who browse the gameday photos are exposed to special offers run by the team for tickets, merchandise, and special events. Gigapan™ is a trademark of Carnegie Melon University. TagOramic™ is a trademark of Major League Baseball.